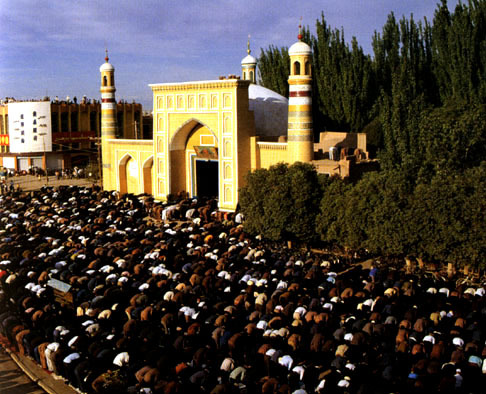 Location: The Id Kah Mosque is located in the city center of Kashgar, on the Jiefang road (means the revolution road in Chinese). Admission fee: RMB20/p.p and women are not allowed to visit the mosque unless accepted by the abbot. Opening time: Opened all day long. Recommended time for a visit: 1-2 hours. 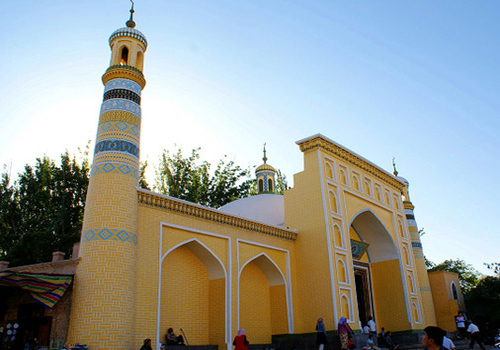 By bus or on foot: Take the line 77 or 13, you will arrive the Id Kah Mosque, if your hotel is Qiniwake Hotel Kashgar, you can walk to the mosque by crossing the alley in front of the hotel. 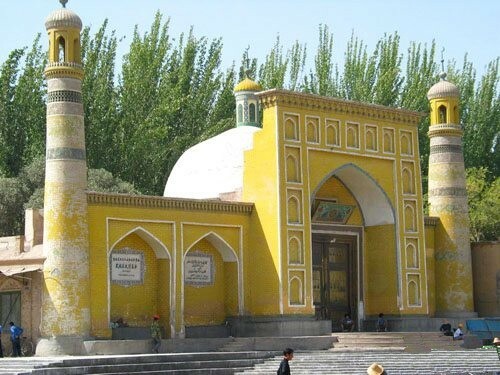 The attraction is also named the Idgah Mosque (or Idgar Mosque), it is the biggest mosque in Xinjiang province; it is the center and Mohammedan activities. The great mosque was built on 1442; the name of Id Kah means the place for doing liturgy on certain days. The entrance door of the mosque is 12 meters tall; the whole mosque is over 140 meters in length and 120 meters in width. 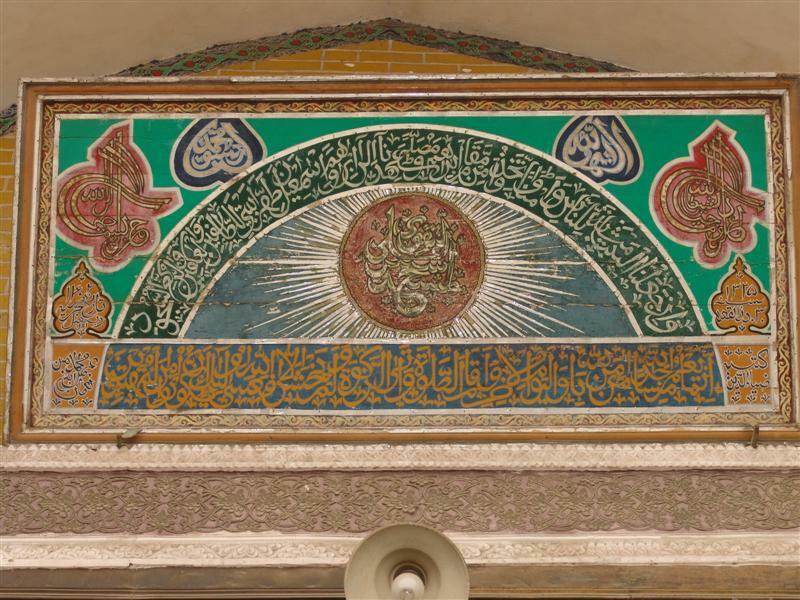 Light green is the featured color of the gate, elaborate carvings are everywhere on the gate, representing classic Islamic characteristics. 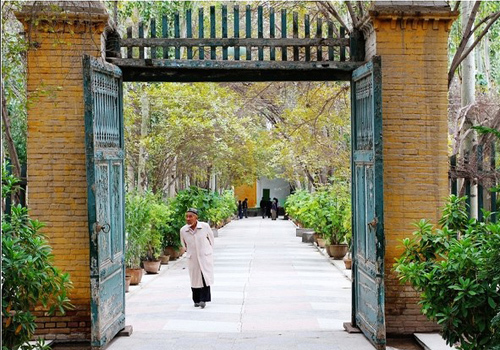 Inside the courtyard of the mosque standing numerous white poplars, mulberries and elms, and two pools are used for ablution. The carpets on the floor are for out-door worships. 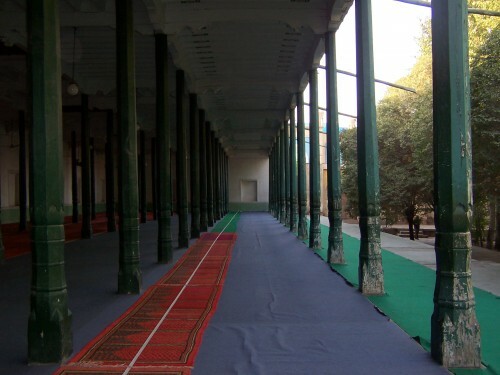 The lection-teaching halls are located on the south and north part of the mosque and two minarets are along the footway from west to east. The Id Kah Mosque is also the place to celebrate the Kurban Festival and Fast-breaking Festival. Islamic rules require that every Muslim must spend a month each year to perform an important "self-improvement", during fasting day they don't eat not to drink, even swallow saliva is not allowed, and only after that their daily routines will back to normal. 1. Taking photos is not allowed inside the mosque unless permitted by the abbot (especially if you want to shot how they perform the weekly liturgy), or you will be driven away from the mosque, the name of the Id Kah Mosque is A Hong. It is better not shoot others in front of them or beside them, it is suggested to get to the mosque before 7:00am in the morning then take the photos you want on the top of the department store beside the mosque. 2. Take off your shoes before entering the mosque and never stand in front of the muslin people when they doing liturgy. Don’t speak loudly or comment on someone or something obviously. 3. 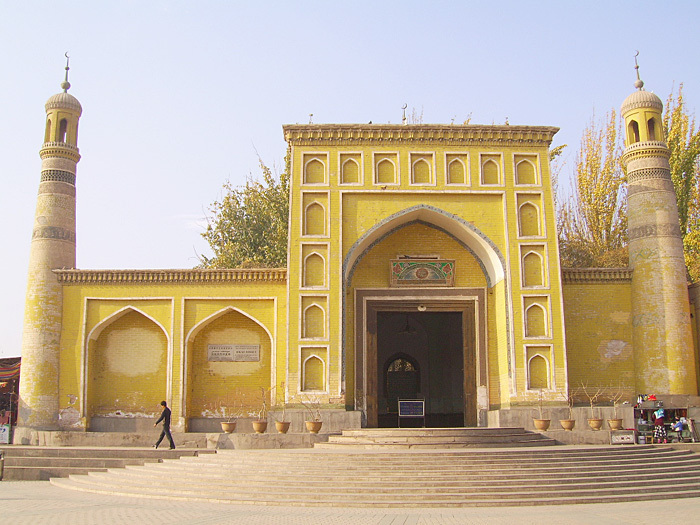 Visiting Kashgar for domestic Chinese is like traveling abroad because only few people here understand Chinese, the menus are written Uygur language, even the police there don’t speak Chinese, so make sure you have tour guide or local friends there in order to better communicate and avoid making troubles.